How can a hazardous waste release affect your community? Hazardous waste can have a devastating impact on coastal communities. Many pollutants are absorbed by aquatic life and build up in sediments, leading to poor fish health, decreased fish and shellfish populations, habitat loss, and restrictions on fishing and other recreational activities. NOAA is responsible for assessing and restoring river and coastal resources injured by hazardous waste releases. After contamination occurs, our experts provide technical support to cleanup agencies, coordinate and conduct Natural Resource Damage AssessmentsInvestigations performed by trustees to identify injuries to natural resources caused by oil spills, hazardous substance releases, and grounding incidents in National Marine Sanctuaries, and plan restoration activities. The goal of NRDA is to restore natural resources and compensate the public for lost recreational use., and oversee implementation of restoration projects. 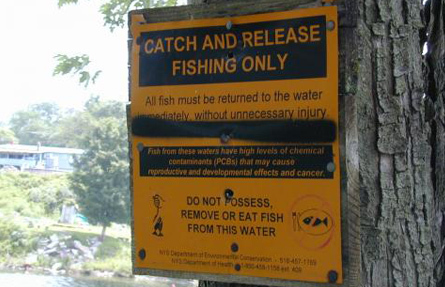 A sign posted near a river in New York warns fishers that the fish there could potentially be tainted with harmful polychlorinated biphenyls (PCBs). Pollution from past and current commercial and industrial activities has impaired our rivers and coasts. NOAA focuses on hazardous waste releases with the potential to harm marine and coastal resources, including chemicals like PCBs polychlorinated biphenyls; a class of chemicals previously used in manufacturing that remain in the environment for many decades, accumulate in living creatures, and pose health hazards to humans, wildlife, and fish., and dioxins, PAHspolycyclic aromatic hydrocarbons; a group of organic contaminants that are often the byproducts of petroleum processing or combustion. Many are toxic to aquatic life and several are suspected of causing cancer in humans., and toxic metals such as lead and mercury. These substances are released into coastal habitats and waterways from many commercial and industrial activities, such as shipbuilding, oil storage and transfer, and chemical manufacturing, among others. Released contaminants can also include discarded products like cleaning fluids, pesticides, and batteries.